Garden with flowers, trees, shrubs, ornamental grasses, vegetables and other plants is very beautiful environment. The visit is pleasant and interesting experience. However, modern garden is much more than environment for plants. Modern living, family or amateur garden is much more than just a collection of plants. It is a place where in a sophisticated way plants interact with various design elements that make the garden more colorful and more interesting. These artificial garden elements make it more human. People are inclined to the nature of editing and trying to improve on its own merits. With a variety of shaping elements we can make the garden more colorful. Garden paths and stairs are the main traffic artery. They serve us for moving through the garden and they discretely prevent us from moving freely freely around the garden. They take visitors through the garden's most important parts. Paths blend with the image of the garden. Terrace, pavilion and sitting places allow us to sit down, relax, enjoy and socialize. Garden furniture is an integral part of most gardens, specially in the family garden. Garden table with garden chairs or benches is usually the central location of the garden, or at least its most important part. If we add the garden grill or barbecue or garden kitchen, this is a great place to spend warm days outdoors with freshly prepared home-made food. If we are a bit more artistically inspired, we can liven up a garden with different decorations. Flower pots and containers of different colors and shapes can be interesting garden ornaments. 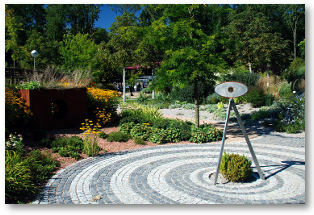 Thoughtfully placed statue, sundial or fountain will make garden to differ from the garden dominated by plants.